The most fiscally irresponsible president in the history of the human race is promising to make the crushing debt he inflicted upon us all better. This is an utterly asinine thing to believe. It will take professionals trained in the dark arts of media propaganda to make anybody believe it. Fortunately for Obama, and unfortunately for the country, those professional propagandists are as abundant as cockroaches. But at least the Washington Times editorial board is casting some light on the liberal lunacy that has this country racing off a cliff. Barack Obama claims Obamacare is necessary to keep the country solvent. This is a strange assertion coming from the most fiscally irresponsible president in American history. Last week in a speech in Portland, Maine, Mr. Obama said the government takeover of health care would “lift burdens” off the middle class and reduce the deficit “by more than $1 trillion over the next two decades.” Yet this questionable claim is a paltry sum compared to the trillions of dollars of debt Mr. Obama’s policies will levy on the same middle class he pretends to be helping. Obamacare, in fact, does not save money. The belief that it does is based on a last-minute analysis from the Congressional Budget Office before the legislation was passed that found that the new health law would reduce the federal deficit by $138 billion over 10 years. But CBO calculations were based on 10 years of revenues under the plan and just six years of expenditures. A straight-up balance sheet shows the plan adding $114 billion annually to the national debt by 2020. CBO now reports that the student loan nationalization slipped into the health care legislation will add an additional $52 billion in debt by the end of the decade. These billions in red ink are small compared to the trillions of dollars in overall debt that Mr. Obama is handing to current and future generations. On March 24, the day after the president signed Obamacare into law, CBO released an analysis of the president’s latest budget proposal. The numbers are sobering. The lowest annual deficit will be $724 billion in 2014, and the red ink will rise every year thereafter. Net interest payments will nearly triple from 1.4 percent of gross domestic product in 2010 to 4.1 percent in 2020. Interest payments alone will consume $5.6 trillion this decade. The Obama budget adds $12.8 trillion to public debt between 2009 and 2020, growing from $7.5 trillion to $20.3 trillion. The current, very high 63 percent ratio of debt to GDP will rise to an unsustainable 90 percent by the end of the decade and is expected to soar to more than 100 percent in later years. So while Mr. Obama claims to be concerned about deficits, he is in fact driving the United States to international pauper status. It’s no wonder that the president attempts to portray himself as some kind of deficit hawk. Polling indicates that the swiftly mounting national debt is a leading issue going into the 2010 election season. 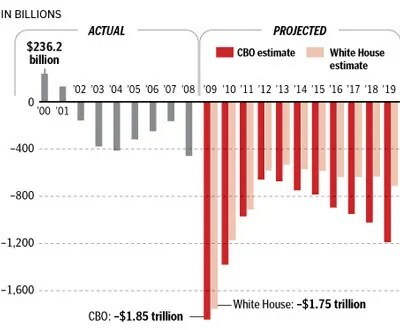 The Obama administration routinely asserts that these were problems the O Force inherited, even though final CBO estimates of projected debt from the George W. Bush administration were much lower, and the base line debt assumptions are raised consistently with each new estimate. Most shocking, the current dire numbers are based on the belief that the economy will recover quickly and fully from its present woes. If the Obama team’s rosy scenarios do not come to pass, these record peacetime deficits will grow even higher. Mr. Obama can make all the claims he wants about his fiscal responsibility but, unlike some politicians, the numbers don’t lie. Obama, according to the CBO, has massively understated his deficits. That ought to give you nothing but naked distrust when you consider his health care claims. I have to disagree with the otherwise spot-on target Washington Times editorial board to this extent: under Obama, the numbers DO lie. The Obama administration and the congressional Democrats have done a very thorough job creating such a self-serving smokescreen over reality that you can’t trust the numbers. That said, the truth doesn’t lie. Which is to say that one day all the lies and the ObamaCare that was the product of all those lies will come crashing down. And it will very likely drag America down the drain with it.